Such pleasure do you bring me." This is it. A bit of the only blue sky I saw while in Europe. And it came at sunset in Berlin. Right outside the German Reichstag (Imperial building). Otherwise, it was grey skies that weren't gonna clear up. 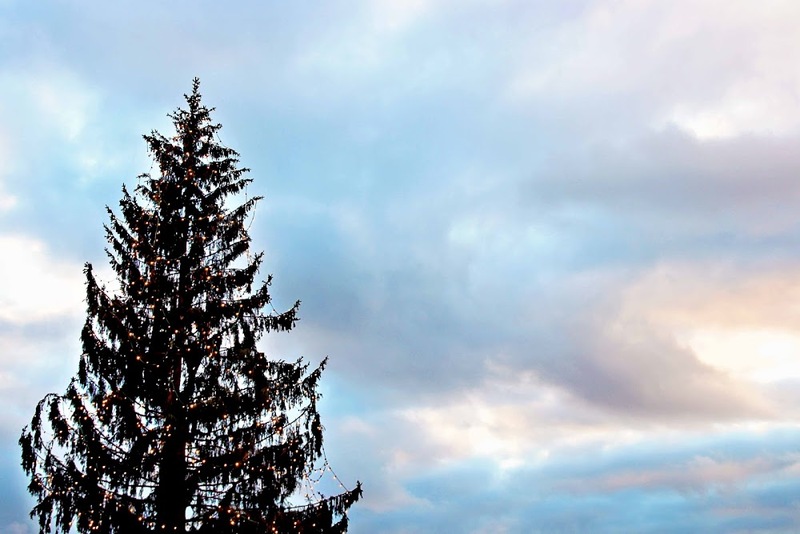 A towering, yet simply adorned Tannenbaum silhouetted by a fading blue sky at dusk. Such pleasure do you bring me. Thanks again for joining in with Song-ography. Please take some time to visit the other participants and see how they interpreted this week's song suggestion. Take a few moments to leave a comment, it's always appreciated. And so much nicer than committing a "visit and run". Tis the season...fa-la-la-la-la. Lovely shot! I do hope you are having a wonderful holiday season and enjoying your trip. For some reason the word verification won't let me use any ID besides Millie's. Sorry. I saw some sun around here today too! A welcome sight. A song I've always liked. Love the lights twinkling on the bows! That silly little German tradition, the Christmas tree - oh I I adore it. The thing with Europe is when it is grey it is decidedly gray - but it is Europe! Wonderful shot! I hope we do see more images of your trip. I would love to see more of Germany through your photos -- even if the skies were gray! Lovely Christmas tree! Great photo!